What better way to capture your little one’s first or second birthday with a fun filled Cake Smash & Splash Portrait Experience. Capture your child's surprise, curiosity and delight as they tuck into their birthday cake. A cake smash is a great way to express your child's unique personality in a relaxed and carefree way. I start with some pre-smash portraits being taken of your child, capturing their many expressions. After we've had loads of fun making a mess of the cake and getting covered I bring out the bubble bath. This is another great way to not only clean your little one up afterwards but to capture some more portraits of them enjoying bathtime. I can provide outfits for the smash part or your welcome to use your own. Simply Classic Sessions are styled on gender colour backdrops: soft pink and lagoon blue, or you can choose from our neutrals range such as grey, cream or white. There is more focus on your little one with less distractions from decorations. These make timeless portraits that will suit any home decor. Styled Sessions can be styled around a theme or a Colour Scheme and tend to have lots of decorations such as ballons and pom poms. If you have an idea for your little one's smash, talk to us and we can help you make that come to life. You can book as far in advance as you like, this ensures you get a slot that suits you best. Most of my clients book before their child's birthday as images from their session are used to display at their baby's birthday party and used for Thank you Cards. All portrait sessions are booked by appointment and each sitting usually takes about an hour. whether you would like individual prints or choose from one of my collections. 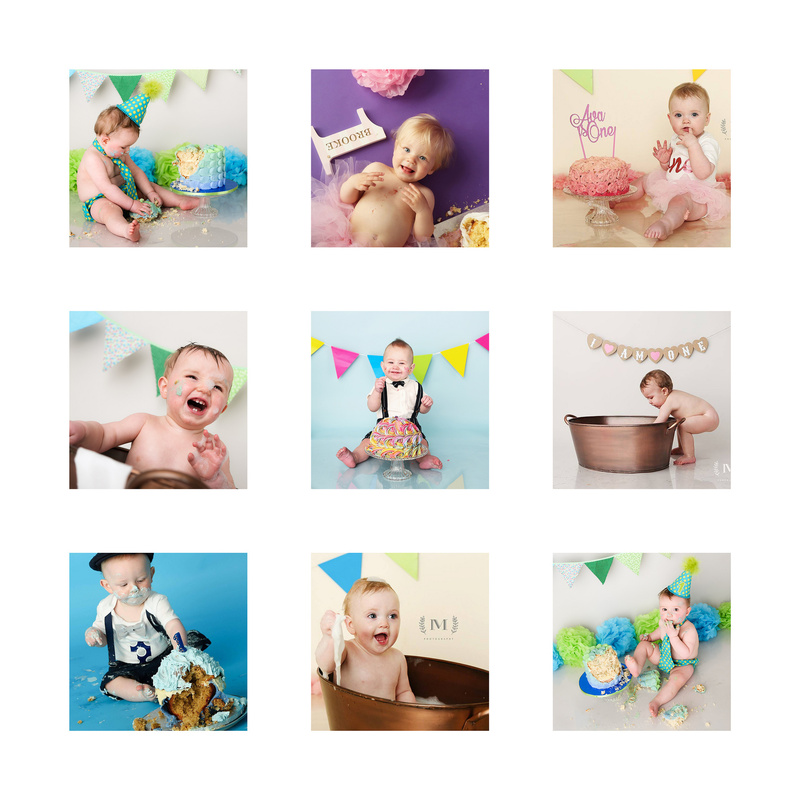 The Cake Smash session includes a complimentary framed portrait of your choice. Additional prints, albums and digital files are charged extra. The session fee is £35 for Simply Classic & £65 for Styled. Prices start from £50 for 8"x10" Print and Collections from £350.